My mom on the day of my wedding. I was so happy she was able to be there.When I was 8 years old, my mother was diagnosed with sarcoidosis; a disease that affected her health for the rest of her life, a disease that is rare and has no cure. She had breathing, vision and muscle issues from the sarcoidosis that were treated with a plethora of drugs. Some drugs were even prescribed to combat side effects of drugs that were treating various symptoms. I don’t know how she or her doctors managed to keep track of it all. I recall one of several instances when Mom was frustrated and not feeling well when she took all of her pills, put them into two large ziploc bags and stopped taking everything it was safe to stop taking. There were so many bottles. Some large, some small, with every size pill and color you can imagine. This is what happens when you medicate symptoms of a disease. Patients eventually get frustrated and have to break the cycle of never-ending pills and the effect they have on their body. The first five years or so after Mom’s diagnosis were the hardest for me. She was adjusting to medications almost constantly - or adjusting to being off the medications. It was a constant roller coaster ride of moods that swung from happy to angry to sad to irrational and unreasonable. I remember several times getting in trouble for something I did and her response being over-the-top and unexpected. Not that I thought I’d get away with what I’d done, but her anger on certain occasions was far beyond the norm. I don’t know what changed after the first five years. Maybe she was able to accept what was happening to her. Perhaps her drug regime finally balanced out. Whatever the reason, I remember life being more peaceful with Mom. She had bad times, but there was less anger, less taking out the frustrations of her debilitating illness on the family. I grew very close to her throughout the rest of my teen years and looking back through the lenses of maturity and grace, I finally saw that the woman we lived with for those five years wasn’t really her. My real mother was kind, gentle, passionate about her beliefs, but also compassionate and generous to a fault. I wrote my mother a letter shortly after I moved to Canada. I told her what I could finally see about those first difficult years after her diagnosis. And I think we both healed any residual wounds. I don’t know what it’s like to live with chronic illness, knowing you’re not ever going to improve, but if I had to I’d want to do it with the grace and dignity that my mother showed. Mom always protected us from the worst of her illness, including when the doctors decided she had neurosarcoidosis - I still don’t fully understand the difference. She didn’t want us to know how scared she was about the way her body refused to work properly. There were times during her years of treatment that she feared she was going to die. Sarcoidosis is not really a fatal disease; many cases have symptoms once that go away and never return. It’s much more unusual to have severe symptoms like my mother’s. But Mom didn’t feel sorry for herself. When she had pen pals who were in worse shape (in wheelchairs or bed-ridden), she wrote them letters of support and encouragement instead of shying away, even when she feared that was the next step for her. When her esophagus muscles stopped working, she just shrugged, chuckled and let gravity do the job. When she had to get a handicapped sticker for her car and was stopped by self-righteous, over-zealous people who felt she was wrongly parked in the spot, she accepted it as a fact of life since her handicap was not obvious. When she broke a couple ribs during a nasty bout of pleurisy, she did little more than mention that her chest seemed sore. She didn’t know she’d broken her ribs until months later. When she fell while walking (and she occasionally did), she’d slowly get up and call herself a klutz while laughing it off. The truth was that her muscles were breaking down and her legs occasionally gave out on her. When she came to Canada for the first (and last) time of her life and ended up in the hospital for half the time (including my wedding day), she never complained. She just did her best to get better and get out as quickly as possible. Fortunately, she recovered enough that the doctors gave her a temporary release to attend my wedding. Through each and every stage of her illness, Mom moved through life with purpose and without complaint, always willing to laugh at herself. When I think about my mom, I know that I am blessed in ways beyond measure. Because she was my mother. Because she gave me such an inspiring example. Her dignity and grace in the face of what became a lifelong challenge will always inspire me to be a better person. This post was based on the prompt “Describe a woman who inspired YOU” from Mama Kat’s writing workshop and written in participation of Bigger Picture Moments.“A moment where you recognized the role your faith plays in your every day life. A moment where you take note of motherhood and the importance of what you are doing. A moment that made you stop and breathe in the bigness of it all. 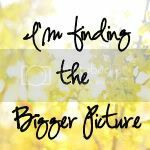 The hugeness that is life and the small moments adding up to one Bigger Picture.” Join in by linking up at Bigger Picture Blogs. Within the last year, I’ve had some experiences that have slowly changed me. I feel myself becoming more cynical, negative, even jaded. I’ve found myself feeling overly suspicious of people’s motives and intentions. It’s partly a coping mechanism, but I don’t like this new aspect of myself. I like to think I’m a trustworthy person and I’m willing to trust people at their word until proven otherwise. But I’m starting to question what I’m told on a regular basis. I think it’s healthy to be discerning, but automatic distrust is hard for me. It doesn’t feel right. The battle between my natural instinct to accept everyday occurrences at face value and my newly minted cynical side is weighing me down with stress. I alternate between resistance to this change and wanting to go with the flow because it’s easier. It took me months (and my husband’s input) to see this was happening, and weeks to figure out the answer to the problem. Just as I do with my son when he’s getting upset, I have to remove myself from the situation. It won’t be as easy as plucking a child off the floor and carrying them to another room, but one way or another I’ll figure out how to make it happen. Written in participation of Bigger Picture Moments, “A moment where you recognized the role your faith plays in your every day life. A moment where you take note of motherhood and the importance of what you are doing. A moment that made you stop and breathe in the bigness of it all. The hugeness that is life and the small moments adding up to one Bigger Picture.” Check out this week’s posts at Madeline Bea. Sunday I was looking for something to do with Brandon to get him out of the house. Matt didn't sleep well Saturday night and I wanted to take Brandon somewhere fun so he could get some extra rest. Someone suggested the Children's Museum at the Canadian Museum of Civilization - a place I'd thought about but didn't think would actually be open during the time I wanted to go. Turns out they were. So, I hastily got everything ready and we were off. Brandon ran happily beside me as we walked from the garage to the main building and then up the stairs. He likes going to new places, but he gets bored standing still for too long. Waiting for two people ahead of us to finish buying tickets was too long for him, so he tried to wander off. To attempt to distract him, I pointed out a display of Eskimos with sled dogs that was sitting on top of the ticket booth. At first, he kept calling them horses, but finally believed me when I said they were dogs. Then he started yelling, "Dogs, dogs" over and over. I was in the middle of trying to pay and he's walking away to get a better view of the dogs. That's the most challenging part of taking him out alone now. He's old enough to know how to walk off on his own, but he still doesn't completely get it when I tell him to come back. I didn't worry too much about it in this instance because he was focused on the dogs - his line of sight (of the dogs) was in my line of sight, but I could tell the museum workers were getting a little nervous. I paid as quickly as I could and tried to usher him into the Children's Museum. But he didn't want to leave the dogs. He thought they were real and I'm sure he was dying to pet them. They were pretty realistic (except for the not breathing, not moving, not making noise part and a two-year-old can be forgiven for not picking up on that). I forced the issue. I picked him up and carried his screaming, flailing, unhappy little body into the Children's Museum, because we were there to have fun! My little future bus driver. He was thrilled to be at the wheel!I thanked my lucky stars when I saw a bus at the entrance. Brandon adores buses. Everywhere we go, he dutifully points out every single bus we pass - school buses, OC Transpo buses, coach buses, etc. Every single bus that we pass, he points it out. At first he wasn't sure what to make of this bus sitting there just for him to climb into, but it didn't take long for him to figure it out. Five minutes after we got to the bus, I was ready to move on to find something new. I wanted to find the Bob the Builder exhibit - he also loves Bob, Wendy, Scoop and the gang. If we had to stay at the Bob the Builder exhibit, it would be worth the price of admission. But there was absolutely no way to get Brandon to budge out of the bus. Fortunately, the children who got on for the first 10 minutes or so weren't interested in taking his spot in the driver's seat. I was disappointed that I'd paid admission to the museum (just for myself) to go sit in a bus the whole time. So, after a while, I decided to force the issue again. It worked once; surely I could make it happen again. I want to go back and get better pictures of this with my DSLR. The iPhone just doesn't do it justice.For one thing, finding the elusive Bob the Builder exhibit just didn't happen as quickly as I'd hoped. I knew he'd get distracted from the bus if he saw it, but we were weaving in and out of all the activity areas and exhibits and I couldn't find it. All the while, he was miserable and screaming. Bob the Builder just wasn't obvious at that moment and there wasn't anyone readily available for me to ask. It was during this time that I mentally threw my hands up in the air and surrendered to Brandon's cries, deciding that this trip was going to be about what Brandon wanted to do. If he wanted to spend the entire hour we had in the bus, then I would be more than happy to let him. So, I put him down and he led me, crying the whole way, back to the bus. He stood for a moment at the entrance just looking at it until I told him to go ahead and get on. I guess he thought he was in trouble and I felt bad for that. As the five children each took turns at the wheel, one of fathers - an Indian man - said something I didn't catch, but I think he was checking the make and model of the bus. This particular bus was from India and the man knew about them from when he lived there. He and his wife told our informal little group that the ornate design of the bus was pretty standard (I'm not sure if he meant just in his area or across India). He said that the privately owned buses are sometimes not as safe as public buses and his wife pointed out that they have horns that don't beep, but play music instead. It was pretty neat to get the opportunity to hear from someone knowledgeable since the display itself didn't say much about the bus. We would have missed out on that if it weren't for Brandon's determination to hang out in the bus. All the families who joined us on the bus were so nice to Brandon, making a point of giving back the driver's seat to him as they left. As long as he got to sit in the driver's seat, he was happy. But it was very clear after a little while that he was getting tired, so his unhappiness at each new child he had to share with was increasing. I decided that I couldn't wait for boredom to set in. I had to get him home. So, we left the bus and we left the museum. And I left happy that we'd spent the time in a bus because Brandon loved it - and that was worth every penny of the price of admission. P.S. We're going back tomorrow! I'm hoping to find that Bob the Builder exhibit (assuming it's still there) and get better pictures of the bus, too. Written in participation of Bigger Picture Moments, "A moment where you recognized the role your faith plays in your every day life. A moment where you take note of motherhood and the importance of what you are doing. A moment that made you stop and breathe in the bigness of it all. The hugeness that is life and the small moments adding up to one Bigger Picture." Check out this week's posts at This Heavenly Life. Last weekend I had a phone call with someone I consider to be a very close friend, someone I've known most of my life and who knows me better than probably anyone other than my husband. We discussed shared experiences from years gone by and how maturity has allowed us to look back with a very different perspective on events we thought we had all figured out when we were living through them. In the course of our marathon talk (over three hours), we realized that we'd had very similar shifts in thinking about circumstances that were significant in both our lives. We attributed our hindsight to learning previously unknown facts related to certain situations as well as the ability to see things from an adult's point of view, factoring in all of the responsibilities that adulthood entails - for us, that included marriage and children, which happened to be very helpful to gaining a better understanding or empathy for what we went through. I find it interesting that many years after living through what felt like such a negative experience at the time can be softened by considering factors I was too young to process at the time. It doesn't make the circumstances less negative, but it certainly puts a different spin that can make it easier to forgive real or perceived wrongs, let go and move on. On the other hand, there is also greater awareness of machinations and manipulations that created unnecessary hurt and problems for so many people. That's the hard part to let go. These divisive actions continue to cause hurt and negative influence to this day because not everyone sees the events with the same perspective. Perspective is a wonderful thing; it can change with a few words or new facts. It isn't like an opinion - you're not considered wishy-washy if you have a legitimately altered perspective. However, it's far too easy to hold on to a certain point of view when you don't have all the facts, or if someone is skewing them. In my personal experience, looking back on many of the challenging situations I dealt with as I was growing up has given me a far more positive perspective - one that is freeing. I'm free of resentment, anger and hurt that could have negatively affected long-term relationships. I'm grateful for the clarity looking back has given me. I don't know every detail, but I know enough of the crucial ones to be comfortable that my current point of view is far more accurate than my limited understanding at the time allowed. Have you experienced major shifts in your thinking as an adult? How did it impact you and your relationships with the parties involved? Written in participation of Bigger Picture Moments, "A moment where you recognized the role your faith plays in your every day life. A moment where you take note of motherhood and the importance of what you are doing. A moment that made you stop and breathe in the bigness of it all. The hugeness that is life and the small moments adding up to one Bigger Picture." Check out this week's posts at Trains, Tutus and Tea Time.